Tears filled Carley Ingram’s eyes as she told a police officer how her landlord, Fergus Wilson, had abused her trust. Reporting what she believed to have been a sexual assault was traumatic, but her burning sense of injustice overrode any feelings of fear. She was relieved when Wilson was arrested over her allegations. But, four months later, the investigation was closed. ‘The police said there wasn’t any evidence,’ says Carley, 39, who was evicted from her two-bedroom home the week after Mr Wilson’s arrest. Mr Wilson has not been charged with any offence and must be treated as innocent of these allegations. However, Carley assumed that she would at least finally be able to put the landlord out of her mind. In January 2015, eight months after Carley made the allegation against Mr Wilson, she received a letter from the 70-year-old, who along with wife Judith, 68, has been labelled Britain’s biggest and most disliked buy-to-let landlord, announcing he was going to sue her. The Wilsons — who at one stage owned around 1,000 properties in Kent and have amassed an estimated £225m fortune — were suing Carley, a single, cash-strapped mother of two small children, for £10,000 for harassment because, Mr Wilson claimed her allegation was malicious. The action by the Wilsons, who have just announced plans to sell their remaining 300 properties, crashing local house prices and potentially leaving scores of tenants homeless, almost destroyed Carley. And her sad story is just one of the many that a Daily Mail investigation into Mr Wilson’s business practices has uncovered. Ask Mr Wilson, on the other hand, what it was like being wrongly accused of sexual assault — surely among the most devastating allegations a man could face — and he sounds cross, but far from crushed. Talking to me on the phone this week, he said Carley made a ‘totally’ unfounded allegation because she was behind on her rent and angry at being made to leave her home — something his former tenant firmly denies. By his own admission a colossus of a man who steamrollers over conversation and appears capable of causing offence every time he opens his mouth, he is, nonetheless, apparently eager to exercise his own form of diplomacy. In the context of a conversation about an alleged sexual assault, his remarks seem inappropriate. But they are perhaps unsurprising. This is the man, after all, who in 2014 hit an estate agent over the head in an argument over a boiler. In 2017, a leaked email to a letting agency revealed that he had a policy of not permitting ‘coloured people’ to rent his properties because they made ‘houses smell like curry’ — a ban later overturned by the Equality and Human Rights Commission. Although he denies being racist, he remains staunchly unrepentant as to his appalling remarks on people of different races. Instead, he says he takes more than his ‘fair share’ of Ashford’s black families and ‘we have to accept curry is difficult to get out of the wallpaper’. The same year, leaked letting criteria also reportedly revealed he had banned single mothers, abused women, those earning under £30,000 a year and plumbers — most of whom he suggested he either considered troublesome, likely to lead to damaged properties or prone to falling behind on rent. Last month Judith — in whose name most of the Ashford properties are believed to be registered — was ordered to pay £25,000 in fines and legal costs for failing to supply hot water to a disabled tenant. Yet, not so long ago, the Wilsons were widely respected as aspirational entrepreneurs in Ashford. 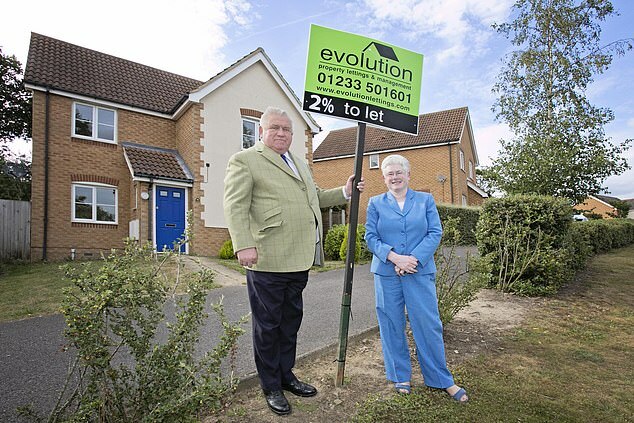 Both former maths teachers, the couple, who have two middle-aged daughters, acquired their first buy-to-let property in 1986, subsequently acquiring a massive portfolio of starter homes in the sought-after commuter town. By the early Noughties, they had monopolised the area, at one stage purchasing a house a day, their wealth increasing by some £70,000 between breakfast and dinner as property prices soared. 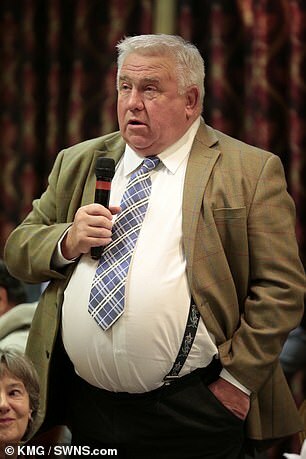 Neither Fergus Wilson, one of nine siblings and the working-class son of a Ford car plant foundry worker, nor Judith, whose father ran a nursery business, flaunted their burgeoning bank balance. They drove second-hand cars, shunned holidays and endearingly insisted their wealth ‘didn’t really mean anything’. But Mr Wilson’s recent disparaging comments mean respect for the couple has been replaced with revulsion. The couple live in a relatively modest £1.25 m home on the outskirts of Maidstone, surrounded by four Dobermanns and a sign outside the front gate reading ‘Smile, you’re on CCTV’ . And — sadly for poor Carley — they still have her in their sights. ‘All Wilson does is belittle and insult,’ says Carley, whose sons were aged six and ten at the time she reported Mr Wilson to the police. She recalls how happy she was to move into Mr Wilson’s two-bedroom property in 2013, paying £800 a month in rent: ‘It was near the children’s school and my best friend lived down the road,’ she recalls. Mr Wilson met Carley on the morning of May 7, 2014 to investigate a window broken during a previous tenancy. Mr Wilson says that during this time Carley ‘ended up telling me all the problems in the world’ before he left ‘at the appropriate time’. Of course, Carley’s account differs, but because the police found no evidence to corroborate her claims, the Mail cannot repeat her allegations. It appears she was more affected as a result than Mr Wilson, who, when I ask if he was upset about being arrested, says, ‘only for a relatively short period of that day because it took so much time up’, — time, he says, when ‘I could have been earning money’. When, the following January, Carley learned she was being sued for £10,000 (the maximum Mr Wilson could sue her for), her distress intensified. With only around £200 spare after paying her rent each month, she says she couldn’t begin to prepare for the potential pay-out if she lost. ‘Every time I got letters my stomach would flip.’ Even though Mr Wilson now can’t sue Carley, he has no intention of laying the matter to rest. He says he is suing Kent Police for £1 m for their handling of the case — a ‘claim for compensation’ police say they are unable to comment on — and intends to use his considerable fortune to take out a private prosecution against Carley for perverting the course of justice. Surely he’s not still after her money? ‘She doesn’t have any money,’ he says. Instead, he intends to land her in prison. Strangely, however, Wilson insists he isn’t bothered by other smears against him, dismissing many as ‘fake news’. The Wilsons’ business has also, he says, been impacted by a lack of workmen willing to repair his properties in this Brexit era, leading to an influx of tenant complaints. ‘We were so reliant on European workers who’ve returned home. Can you find me some Eastern Europeans?’ he asks. Emma Beaney, 26, was forced to move from one of the Wilsons’ houses last April after three years. During her tenancy, Emma, a hairdresser, married to Shane, 27, a factory worker, says the bathroom flooded three times and pipework under the sink broke. Last January, Emma says Shane kept getting electric shocks from the sockets: ‘Then one day the wall got wet from where, we realised, the boiler had been leaking. Mr Wilson says he doesn’t recognise Emma’s name, but that her story sounds ‘symptomatic of the fact there are no workmen’. 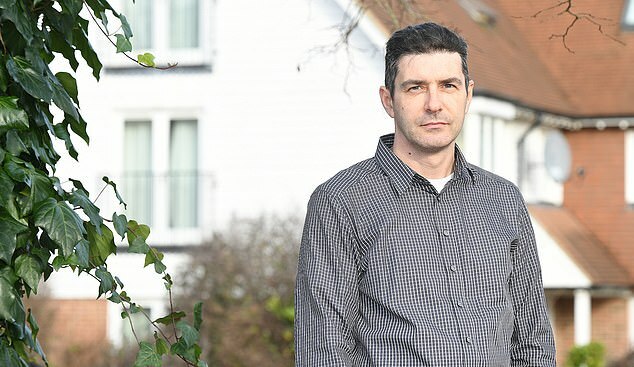 He adds that the 24 hours’ notice requirement does not apply to a flood situation and that ‘it sounds like I didn’t want her as a tenant because of the difficulty getting into her property’. In May 2015, he noticed a wet patch on the carpet that got bigger every day. ‘We found it coming out of the boiler and reported it to the Wilsons on a Thursday or Friday. 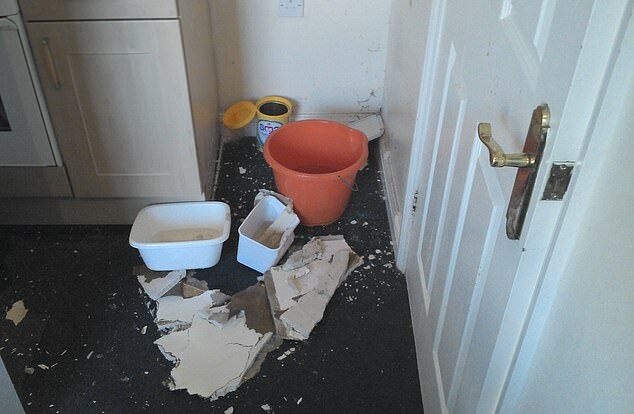 He says that by the time the family left that July, the leak still hadn’t been fixed, and, shortly afterwards, he was astounded to learn he was being sued by the Wilsons for £4,000 for the damage the leak had done to the property. Aghast, Mr Lant enlisted the help of Kent Law Clinic at the University of Kent, which has offered free legal advice to Wilson’s tenants. His solicitor, Vivien Gambling, brought a counter claim against Judith Wilson — whose name the property was in — for failing to repair the leaking hot water cylinder. The judge found she was in breach of her obligation and awarded Mr Lant damages of £2,500. ‘The judge said he could not understand why it wasn’t fixed and that the case could easily have been sorted out,’ says Gambling. Mr Wilson, for his part, describes Mr Lant as a ‘man with lots of problems’ whose partner refused to let him into the house to fix the water tank, claiming all three attempts Mr Wilson made were inconvenient. ‘It was fixed as soon as we had access. I did not evict him. I was prepared to put him back in a comparable house. He left before we had the possession order,’ he says. As our conversation ends, I ask him how much he is worth as he winds down his property empire. £100m? ‘I’m worth more than £100m, thank you,’ he says, adding that ‘the value of houses goes up by the minute’ so he can’t reveal his ‘precise’ wealth. 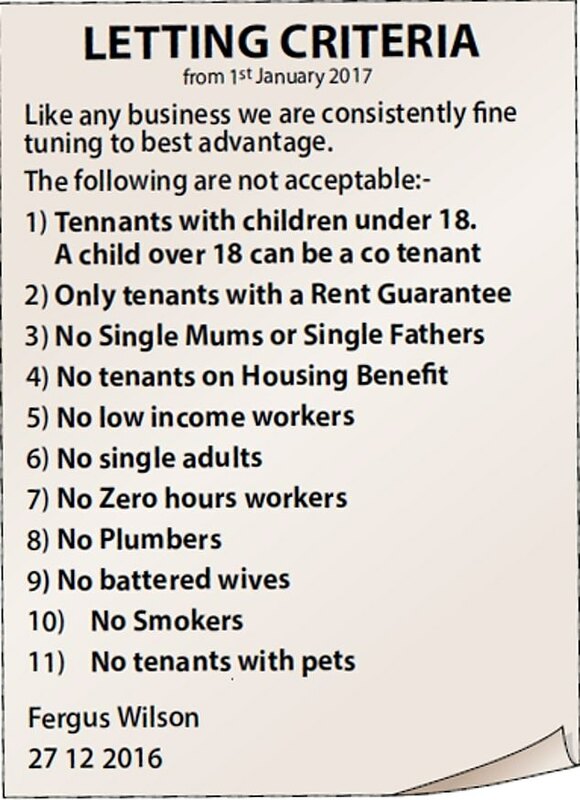 More than a little sickening, no doubt, for those hard-up tenants he’s turfed out and sued for every last penny. In the seven days after I interview Mr Wilson, he sends Mail reporter Stephanie and me around 15 emails. They contain details of a legal case he has won, and correspondence between former tenants he claims proves he is a good landlord. 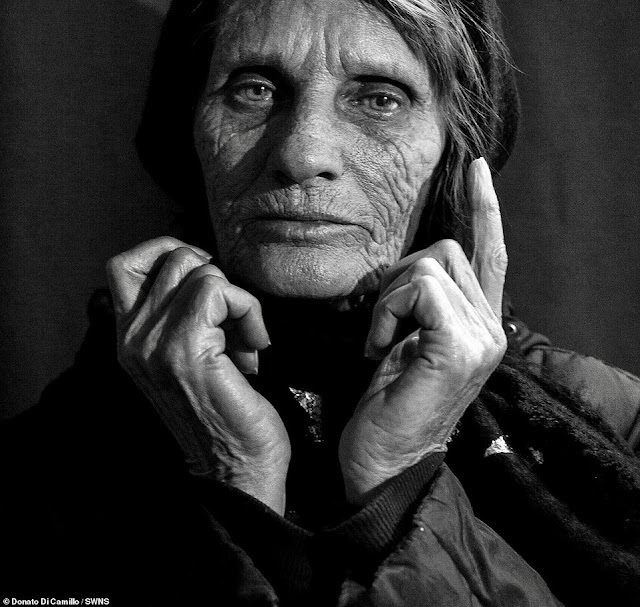 He sends us a ‘source folder’ he has compiled for his work ‘in taking battered wives’ — it contains 107 pictures of horrifically beaten women. He forwards me a warning he has issued to a charity worker who has written a blog about him he doesn’t like, and a disdainful email he has sent to the representative of an unhappy tenant. He signs off one email with ‘my regards to [your husband] and the kids!’, referring to my husband by name. I haven’t told him I am married, my husband’s name, or that I have children. Were it not for the knowledge that the Mail will protect me, I would feel intimidated. I realise how afraid his unhappy tenants — who have no representation — must feel.